One of Ireland’s greatest gifts to the world has been to literature. James Joyce, Bram Stoker, Frank O’Connor, William Butler Yeats, George Bernard Shaw, C.S. Lewis, Oscar Wilde, the list goes on and on. 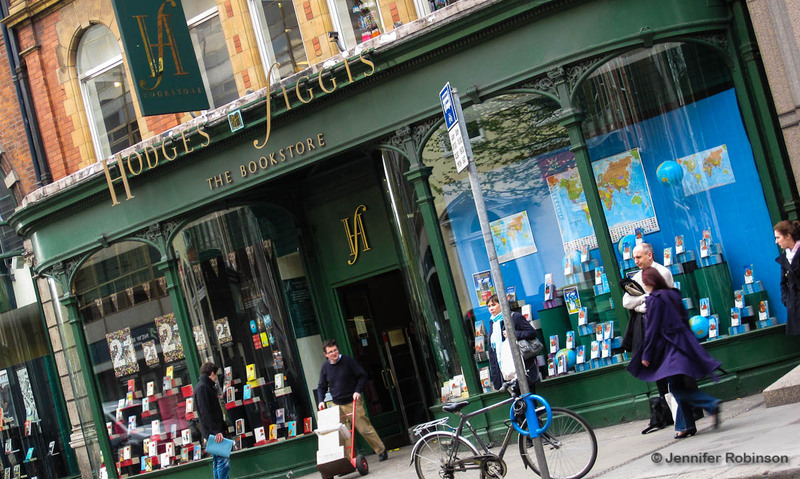 A great way to pass an afternoon or two in Dublin is to stop by Hodges Figgis, the country’s best bookstore, and peruse its huge array of Irish novels, plays, poetry, and historical works. Located at 56-58 Dawson Street, the shop is a thing of beauty. As soon as I laid eyes on it from the top of the #10 double-decker bus, I was smitten. The outside is dressed in traditional hunter green and gold with beautiful curved windows showcasing the latest wares or featured authors scheduled to give in-store readings. Founded in 1768, Hodges Figgis has moved at least three times in its history. It is such a fixture in the Dublin landscape that Joyce even referenced it in his massive novel Ulysses. Inside, are three floors jammed with a fantastic selection of books. Don’t miss the basement and its bargains. It’s a great spot to pick up the classics and non-fiction paperbacks. I always imagined — and hoped — bookstores looked like this when reading about the Victorian era. As a student in Dublin, Hodges Figgis became my refuge and a lifesaver in the scramble for materials to write essays when the James Joyce library at University College Dublin failed to have key texts in its holdings (which was often). It not only contains an amazingly curated selection of top Irish and international fiction and non-fiction, it also has a friendly, relaxed vibe inside. And the staff are knowledgeable and friendly — they know their sections like the backs of their hands. I don’t know what it is about this bookstore. I’d walk in looking for something, say Susan Sontag’s On Photography, and walk out with a couple of Graham Greene novels, Jessica Mitford’s Poison Penmanship and Tim Butcher’s Blood River. It was my own personal Kryptonite. All those euros carefully saved . . . I think the other amazing thing about Hodges Figgis is that it takes reading seriously. You can still find your guilty pleasure novels here that can be devoured in an afternoon but the store seems to pride itself on introducing great authors to those casually browsing. The prices, even with the exchange rate, are still cheaper for Canadians hit hard by higher prices and taxes at home. And, British publishers make cooler book covers. They just do. It’s also nice to shop in a store not overrun by American paperbacks on display. And for those sticking around in Dublin for a while or with lots of room in their suitcases, the store offers a savings card. For every €10 spent, you get a stamp in your booklet and when you reach the tenth stamp you get €10 off your purchase. I can’t tell you how many of these paper booklets I went through when I lived there last year. The only negative about Hodges Figgis is its computer search system, which must be conducted by an employee in store. If you don’t know the exact title, author or ISBN number it’s nigh impossible to find books on the subject you’re looking for. The store also doesn’t operate a website. If you’re looking for an antiquarian bookshop in Dublin, just around the corner on Duke Street is Cathach Rare Books. To be honest, I never dared enter this charming shop. To do so would have been dangerous for a student on limited funds! Instead, I would drink my coffee and stare in the window at the first editions by James Joyce, Yeats, as well as colourful children’s books. For those unable to make it to Dublin any time soon, Cathach does offer an online shopping option for armchair travellers who love to read.